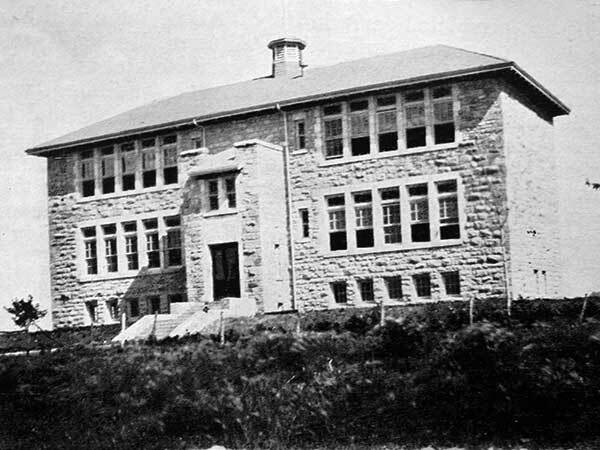 The Happy Thought School District was established in March 1908 and a two-classroom, wood frame school operated in the village of East Selkirk in the Rural Municipality of St. Clements. 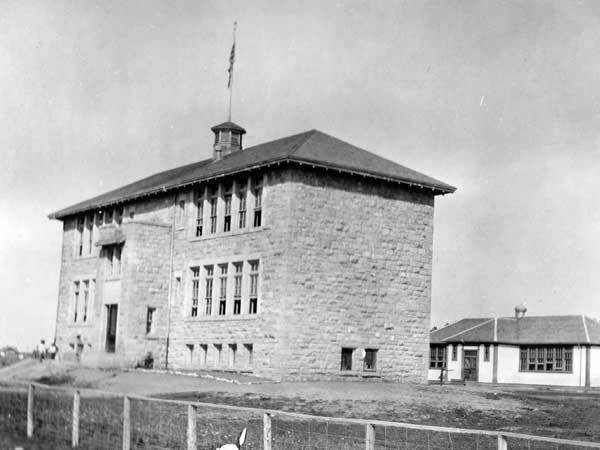 In 1917, it was replaced by a two-storey, four-classroom stone building constructed a design by Winnipeg architect E. D. Tuttle, using stone taken from an old railway roundhouse nearby. In 1960, it became the Happy Thought Consolidated School District then, in 1967, it joined the Lord Selkirk School District. The building was demolished around 1989. The namestone from the former school stands in front of its replacement (about N50.13103, W96.82678). Angus E. McKenzie (1908-1909), Clifford A. Wilson (1909-1912), Lewis M. McGuire (1912-1913), Reggie Royston (1914), J. A. Waling (1914), Robert Johnson (1914-1916), Lewis Inglott (1914-1915), Jean P. Paterson (1916), Ida Norman (1916-1917), E. L. Kerr (1917), A. L. Swanton (1917), Agnes Judge (1917), Emma Thompson (1917-1919), Evelyn R. Hicks (1918), Eleanor J. C. Pophan (1918), Mary D. Stafford (1918), Lucy Mary Baldwin (1918-1920), Elizabeth Traynor (1919), Miss Hanesson Slahkuk (1919), Mary D. Stafford (1919), T. D. McMeekin (1919-1920), Isabel Calder (1919-1920), Alex Cowan (1920), Jean A. Coper (1920-1921), Mary Maude Rowley (1920-1923), Frances Jones (1921-1923), Mrs. W. L Wallace (1921), Hazel S. Campbell (1922), K. Marshall (1922), Sadie M. Vance (1922), Florence E. Sutherland (1923-1924), Vera Elsie Massey (1923), Elsie Gertrude Jones (1923-1925), Peter G. Kuhn (1923-1924), Maurice Franklin Pringle (1923-1924), Rose Shline (1924-1926), Joyce E. Freer (1924-1926), Isodore Goresky (1924-1925), Teenie Kozier (1925-1926), Ada Booke (1925-1921), Frederick Andrew Justus (1925-1929), Phyllis Marion Frank (1926-1931), J. Hallie Rowley (1926-1930), Mary Runge (1926-1927), Valentina Couture (1921-1928), Gladys Margaret Frank (1927-1928), Alice Jean Stranger (1928-1930), Frank Alexander Wachal (1928-1929), Cora O. Parkhill (1928-1929), May Kenny (1929-1941), Eileen Beatrice Creighton (1929-1930), Mary Annette Elizabeth Romanick (1929-1930), Flora Loretta Campbell (1930-1934), Audrey Joan Grove (1930-1932), Mary Edeline Kondratuk (1930-1937), Jennie Mary Ogryzlo (1931-1941), Kay Laura Anne Baydak (1932-1937), Michael Ewanchuk (1933-1934), Nellie Medal (1934-1936), Emily Macrovicz (1936-1940), Anda Toporeck (1937-1940), Alexander Mack (1937-1940), Peter Maydan (1940-1941), Jean Treleaven Tweed (1941-1942), Lucy Janey McDonald (1941), Pauline Marie Copot (1941-1944), Ann Olga Budinsky (1941-1944), Mary Karpetz (1941-1942), Peter John Humeniuk (1941-1942), Isabel Marcelline Howelko (1942-1943), Isabel Florence Laird (1942-1943), Nellie Sozansky (1942-1945), Annie Chimchak (1943-1945), Betty Barnson (1943-1944), Betty L. Hart (1944), Jean Lyzun (1944-1947), Sonia Lisowecki (1944-1945), Madeliene Karandiuk (1945), Joy Mary Lydia Kilfoyle (1945-1946), Ann Sametz (1945-1946), Lena Margaret Copeland (1945-1951), Eva Bonkowski (1945-1947), Florence M. A. Gendreau (1947), Maureen Westgate (1947), Christine Fraser (1947), Lucy Anne Bellay (1947-1949), Margaret Elizabeth Stevens (1947), Miss Adelmar Friesen (1947-1948), Lena Nechwediuk (1947-1948), Helen Menzie (1948), Mary Barchuk (1948-1952), Casimir Hollinger (1948-1952), Gilberta Marie Allard (1949-1951), Elsie Korotash (1951-1953), Melvin Stewart Bell (1951-1952), Jean Sokolowski (1952-1954), Mary Byskal (1952-1953), Elsie Stasuik (1953-1963), Frances L. Wozlowski (1953-1957), Jeanne Valerie Korotash (1954-1957), Mrs. Mary Clementine Milne (1954-1968), David Semenko (1955-1963), Francis L. Wesley (1957-1968), J. Zegil (1951-1959), Joan Sigurdson (1958-1959), Patricia A. King (1960), Alda Johnson (1960) Sophie Gerylo Klim (1960-1989), Jean Sokolowski (1960-1961), Patricia Goodman (1960), Rolande Belanger (1961-1964), Julian Polowy (1963-1968), Jean Sokolowski (1964-1970), Mary Budz (1966-1968), Pat Bazan (1966-1968), Sharon Bruce (1966-1968), Helen Sum (1966-1967), Anne Dueck (1966-1967), Mitchell Wagner (1966-1967), Paulette Rozak (1966-1977), Mary Theresa Darewych (1966-1973), Abe Wiebe (1966-1983), Miss L. Kosowan (1967-1968), Miss Sharon Kolodie (1967-1968), Miss Forie J. Kolodie (1967-1968), Mrs. Myrtle Anne Feniuk (1967-1968), Miss H. Johnson (1968-1969), Barry Anthony Van Dongan (1968-1972), Miss Barbara Ann Stringer (1968-1970), Miss Sandra Jean McIntosh (1968-1969), Miss Patricia Anne Moreau (1968-1969), Miss Margaret Rose Brewster (1968-1969), Miss Lesley Ann Knight (1968-1970), Mr. Wayne Philip Boch (1968-1983), Mrs. Marianne Helen Preun (1968-1970), Mr. Joe Lesko (1968-1983), Mrs. Carol Elizabeth Klagenberg (1969-1974), Miss Margaret Sandra Skardal (1968-1974), Miss Marlene Patricia Cole (1969-1970), Miss Marlene Dianne Rode (1969-1971), Miss Sharon Margory Shandruk (1969-1971), Miss Judith Elizabeth Johanson (1970-1972), Mrs. Donna Lynne Swire (1970-1975), Miss Agnes Susanne Leadbeater (1970-1971), Miss Catherine Mary Stevenson (1970-1971), Mrs. Lena Catherine Basiuk (1968-1982), Mrs. Barbara Ann Hodgson (1970-1975), Edward Strick (197l-1983), Mrs. Marlene D. Roy (1971-1976), Miss Christine Mary Stevenson (1971-1973), Mrs. Sharon M. Johnson (1971-1973), Miss Paulette Johnson (1971-1972), Miss Barbara Chappell (1972-1974), Mrs. Cheryl Ann Cundall (1972-1977), Mrs. Lena Hoffman (1972-1983), Mr. Andrew Nicholas Zloty (1972-1983), Marilyn K. Woloshyn (1972-1982), Mr. Edgar Imor Stolar (1973-1975), Mr. Oakley Southern (1973-1975), Mr. Donald Andrew Hutniak (1973-1979), Miss Joanne Unnur Sneddon (1973-1979), Robert Jefferson (1973-1982), Mrs. Diana Elizabeth Heneghan (1973-1975), Mrs. Elizabeth H. Wherrett (1973-1975), Mrs. Joyce Irene Williams (1973-1974), Mr. George Arnold Peters (1973-1974), Mr. Herb Streich (1974-1983), Mrs. Shirley Joyce Zacharkiw (1974-1983), Mr. Michael Anthony Zawaly (1974-1983), Mr. John Patrick Grochowich (1974-1983), Mrs. Sharon Elaine Emslie (1974-1983), Miss Jo-Ann Denise Thiessen (1974-1978), Miss Joyce Helen McDougaIl (1975-1977), Miss Sandra Elizabeth Johnson (1975-1977), Mrs. Colleen Evelyn Yakielashek (1975-1977), Mr. Edward Motkuluk (1975-1977), Mrs. Jennifer Margaret Krestanowich (1975-1976), Miss Elizabeth J. Neskar (1975-1983), Mr. Roy Bingham (1975-1983), Miss Donna T. C. Winzinowich (1976-1979), Mr. Myron Taras Tarasiuk (1976-1983), Mr. Ron Wilkinson (1976-1983), Mrs. Jennifer Margaret Krestanowich (1977-1978), Mrs. Joan Mary P. Dunlop (1977-1978), Miss Norma Jean Currie (1977-1978), Mr. Roy Benson (1977-1978), Mary Ann Peterson (1977-1983), Mrs. Shirley Valencia Johnson (1977-1983), Mr. Henry Kolada (1977-1983), Mrs. Sonia Sylvia Podruchny (1977-1983), Miss Colleen Evelyn Federowich (1977-1980), Mrs. Mary Ann Nova (1978-1980), Mrs. Sandra Johnson (1978-1980), Mrs. Jo-Ann Lee (1978-1983), Mr. Herbert Arthur Streich (1978-1983), Mr. Gary Dion (1978-1983), Mrs. Donna T. C. Ezmerlian (1979-1983), Mr. Robert Hummelt (1979-1983), Miss Mary Lucy Grabowski (1979-1983), Mrs. Gloria Jean Wur (1980), Mr. James Wilfred McCorkell (1980), Irene Patricia Kordalchuk (1980). Source: Education Department Report, 1917, Manitoba Legislative Library. GR8461, A0233, C131-2, page 120. “Tenders for school at East Selkirk,” Manitoba Free Press, 28 September 1916, page 2. Selkirk topographic map, 62I/2, Edition 2, Series A743 [Archives of Manitoba]. Obituary [Sophie Gerylo Klim], Winnipeg Free Press, 26 April 2014, page B14.